You’re never too old to dance. That’s what former New York City Ballet soloist Stephanie Saland says. 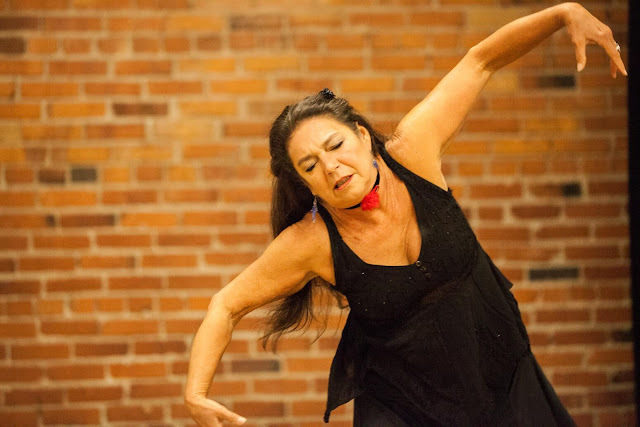 Actually, she never used that phrase in conversation with me; that's the attitude, and the reality, I saw when I sat in on a class she leads most Wednesdays at Seattle’s Velocity Dance Center. Saland shies away from calling this a ballet class, but the ten women who were there were quick to tell me that, of course, it IS ballet. They focus on ballet technique, and execute it to the best of their abilities. All of these women are over the age of 30; a couple are over 50. Most have been part of Saland's Wednesday group for several years at the very least. I think of Stephanie Saland as a ‘dance whisperer.’ I was assigned to profile her for Dance Teacher magazine, and as soon as we met I felt a spark of recognition. Although we have led vastly different career paths, Saland is, like me, une femme d’un certain age. 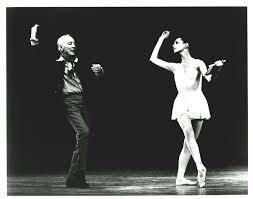 Saland danced with NYCB for more than two decades. After she retired in 1993, she swore she was done with ballet. But after she moved to Seattle with a romantic partner, Saland was tapped to teach classes at the Pacific Northwest Ballet school. Although you’d think that would be a perfect fit for a Balanchine-trained ballerina, you’d be wrong. Saland discovered she was less interested in traditional ballet teaching methods, and more interested in developing the skills she needed to help her students discover their inner artists. Not to say that she doesn’t understand and teach great technique, just that she’d rather help her students unleash their love of movement and self expression. Which leads me back to the Wednesday class. Saland started things off with a slow warm up done to music that you might hear in a yoga studio. 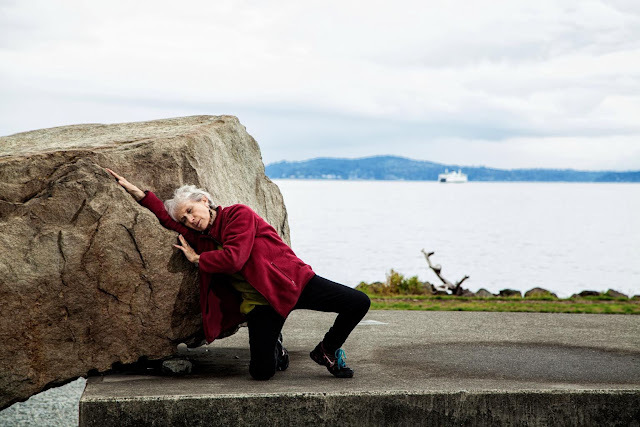 Yes, it’s true, older bodies need more time to stretch stiff muscles. This class doesn’t work at the barre; Saland wants the women in the center of the room because she feels its the best way for them to work on core strength and balance. That said, one woman spent most of the 90 minute class dancing while seated on a wooden stool. Her arms and upper body glided to the music, which Saland had switched to more traditional ballet accompaniment. Another woman steadied herself by placing her hands against the studio’s brick wall. Like their classmates, they focused intently on the combinations Saland set for her students. Everyone smiled, everyone was thrilled to be there. I sat and watched from the floor in the corner of the studio. And wished I was up dancing with the rest of the women. Unlike most people who write a lot about dance, I was never a dancer. 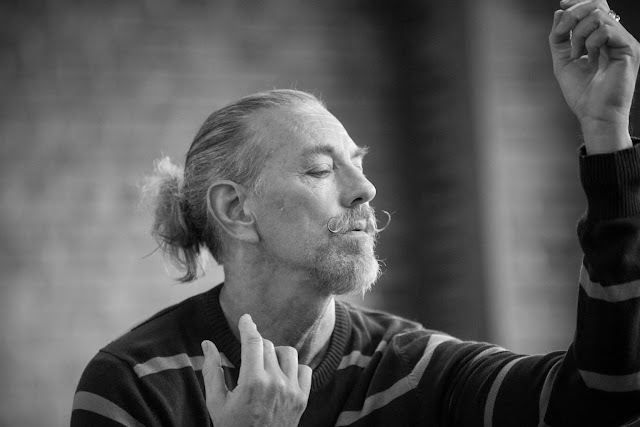 I just love the art form, so I spend a lot of time watching dancers.The last time I took ballet I wound up herniating a disk and aggravating the arthritis in my knees and hips. I was never very flexible, but grand plies after 50…in my experience not the best idea. Stephanie Saland’s class was the first one that made me think, oh, maybe I CAN dance, despite my age and my physical limitations. That glimmer of possibility is something to hold onto in these short dark days at the end of this challenging year. 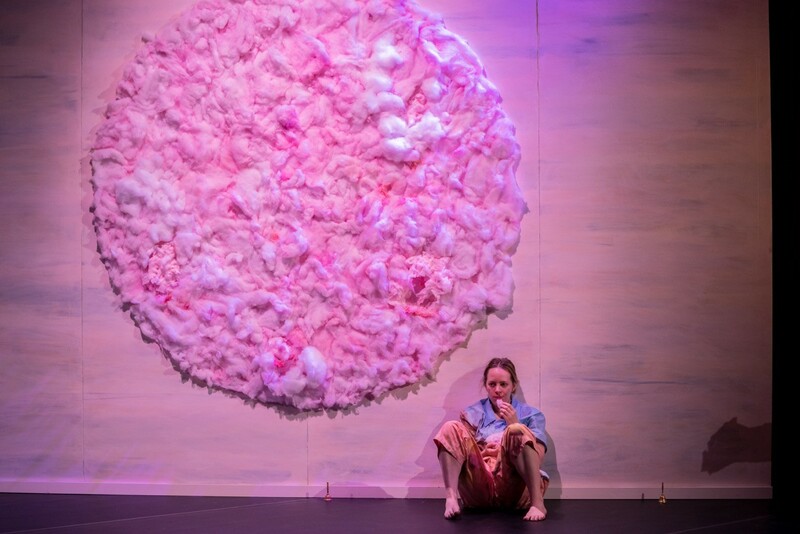 excerpt from Zoe/Juniper's "A Crack in Everything"
If you love contemporary dance in Seattle, then you already know Zoe/Juniper, the artistic duo of Zoe Scofield and Juniper Shuey. Last year they presented their evening length dance “Clear and Sweet” at On The Boards. In addition to some amazing dance plus Shuey's video projected on long strands of material, a group of shape note singers performed live, creating an all together other worldly experience for me, at least. The show gets a New York debut this month. If you live near there you should go see it. Zoe herself is in the middle of a couple other big projects. 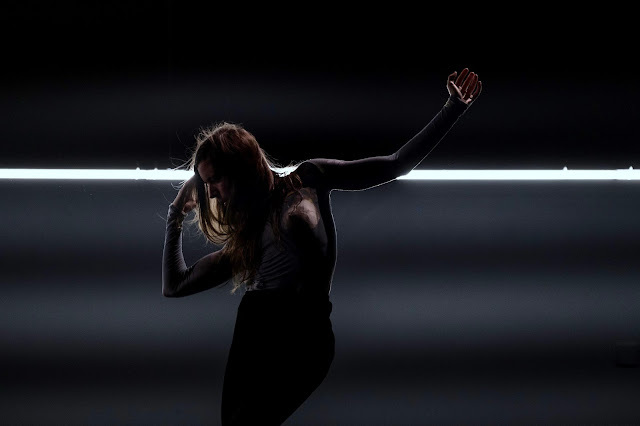 She recently got a Princess Grace Fellowship to collaborate with choreographer Bebe Miller on a dance about how we see and perceive people (and things). 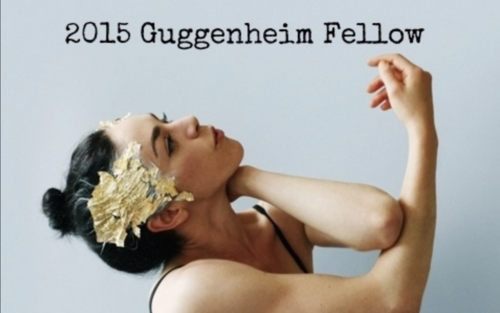 They’ll work long distance, and then convene next spring at Jacob’s Pillow. Zoe is also the recipient of the inaugural Kawasaki Artist Residency at the University of Washington Dance Department. 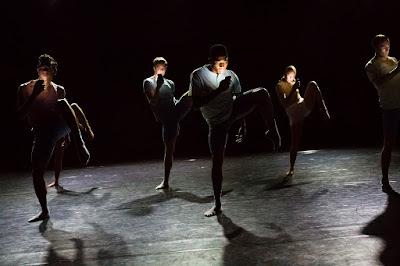 She’s creating a work for more than 20 undergraduate dance students. 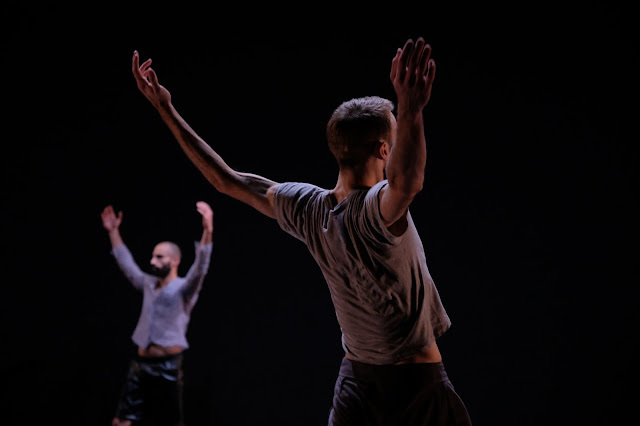 The three-year residency project continues next year with another Northwest choreographer; the third season brings an artist from out of the region. Zoe’s (and Juniper’s) work fascinates me, and this seemed like a perfect time to commit to follow her creative process. I’m going to try to document it for this blog, and maybe other outlets. So, voila installment #1! On a rainy Saturday I went over to a UW studio to watch Zoe work with the students. It’s not a totally novel experience for her (she’s worked with students at both Velocity and Cornish, I believe), but perhaps not for such an extended period of time. Given her hectic pace, it’s not surprising that Zoe was felled by the nasty upper respiratory virus that’s been circulating around town. So she showed up that morning still coughing and with very little voice. Somehow, she summoned the energy to corral the young women and start rehearsal. Every choreographer I’ve watched has a different studio method; Zoe is incredibly analytical, even studious. She keeps detailed notes, including some drawings and movement notation. 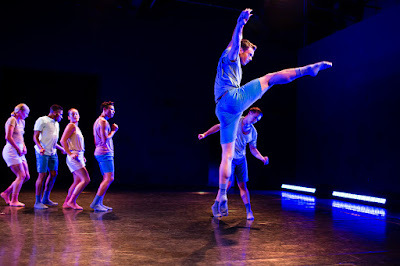 Some choreographers stand up and move through their ideas, a very kinetic approach. If that's part of Zoe's practice, I didn't witness it that morning. Just before the students were set to run through the piece, Zoe and Juniper gathered them together, to remind them that movement is only part of a performance. Intent, attitude and approach are just as important and for this work, the young women needed to own their power. Some of the young women seemed doubtful, but most looked ready to tackle the work at hand. This dance begins with the full cast standing, spread evenly across the stage. Zoe has started a digital metronome; she’s still weighing music possibilities, and will bring in what she calls 'ballet music' at some point, to judge how it fits with the movements. This was interesting to me; some choreographers draw their inspiration directly from a musical composition. Others collaborate in real time with composers. Another way to approach movement! The students start slowly, shifting their weight from foot to foot. There is a distinctive “Zoe” foot that I’ve seen in some of her other dances. It’s flexed, rather than pointed, with toes splayed. Some of these young women have it down; a few others still point rather than flex. Here's that photo from "A Crack in Everything" so you can look at the feet again. I'm putting this photo back in: look at the dancer on the left, who may or may not be Zoe. Check out those toes! Zoe isn’t focused on anybody's feet, though. She’s looking at the spacing, counting movement repetitions, talking to Juniper and UW Dance Department Director Jennifer Salk about musical options. I can’t help but be reminded of a scientist in her lab, carefully monitoring experiment results. Especially when she put on a pair of horn-rimmed glasses. So studious! This dance is still very much a work in progress, but you get a sense of what she sees in her mind’s eye. 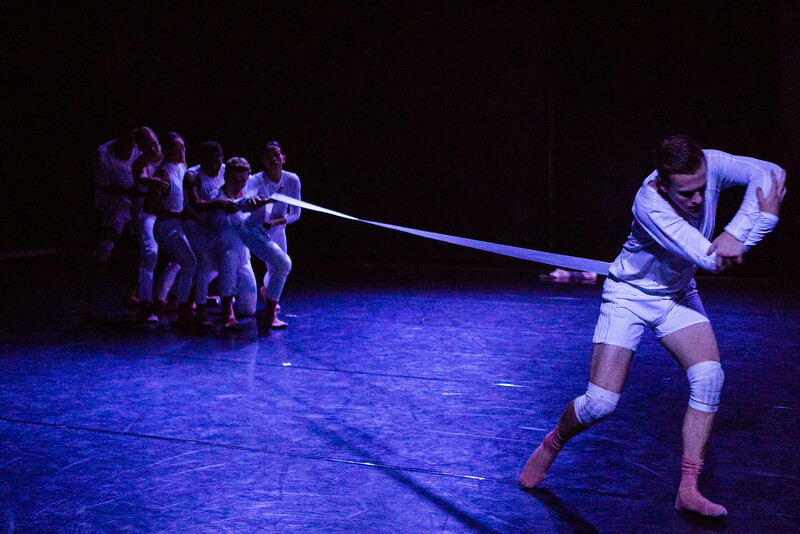 There is power in the sheer number of dancers; there's also a raw emotion in the movement, and a sophisticated syncopation that emerges as the run-through unfolds. Zoe has crafted a section of overlapping solos; each soloist is carried onstage by two of her classmates. One particular entrance amazed me: the soloist is perched atop her colleagues’ shoulders. She looks like a carousel horse. That image gave me chills. And it made me excited to follow the progression of this work. The students will perform it for an audience, and I plan to go see it. But I’m also eager to watch this artist create, the collaboration with Bebe Miller, and to try to get a glimpse inside Zoe Scofield’s amazing mind. oh yeah, Zoe has received a zillion honors, including a Guggenheim and a Stranger Genius Award. 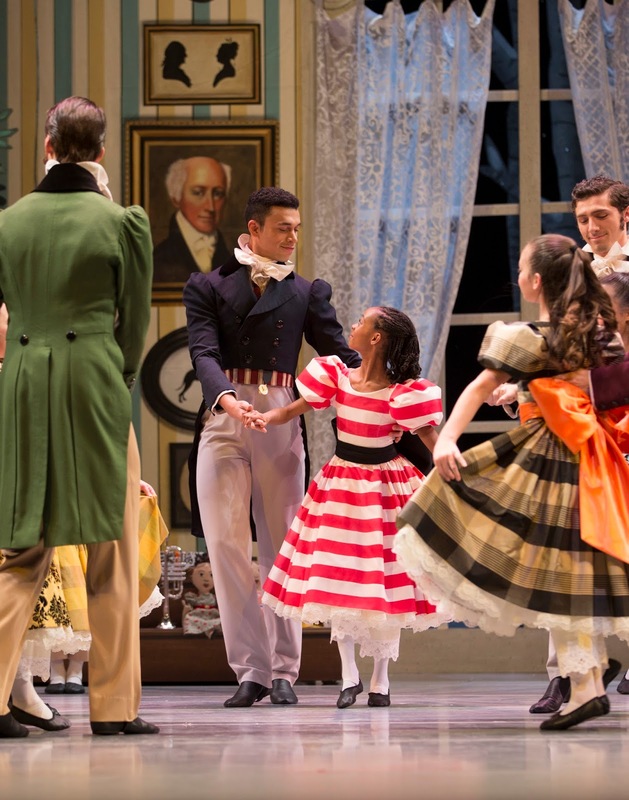 Pacific Northwest Ballet dancers in George Balanchine's "The Nutcracker"
An hour before show time, and the lobby was already crammed; families posed in little scenes culled from the fanciful sets Ian Falconer designed for this production in 2015. Actors and magicians worked the crowd. Little girls twirled madly in their new holiday finery. The energy was so palpable I felt like I was at the start of a marathon race. And in a way, I was. This November 24th opening was the first of 30+ PNB performances of this holiday classic. I had planned to write a a learned screed about the Nutcracker’s history; how the legendary Marius Petipa conceived it in 1892, inspired by the French version of a German folktale (although most of the choreography was created by Petipa’s assistant, Lev Ivanov). I was curious why this particular story, this particular ballet, has become so beloved. It really wasn't intended to endure the way it has. Somehow, though, my serious intent was hijacked by the emotional response I have to this ballet. 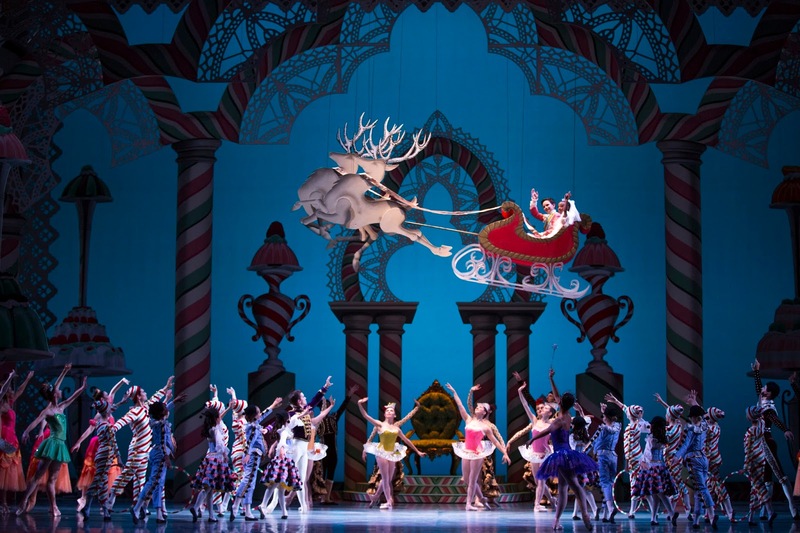 First off, PNB’s three year old production of George Balanchine's Nutcracker, originally choreographed in 1954, is swell. This year I was impressed with the innate grace and stage presence of student Samrawit Saleem in the role of Clara. It was especially nice to hear she's a product of PNB's Dance Chance program. Dance Chance reaches out to kids with physical and artistic aptitude, kids who might not have an opportunity to study ballet, and offers them free ballet training for two years. If they like the discipline, and if their teachers agree, they can continue their training, often with the help of scholarships. 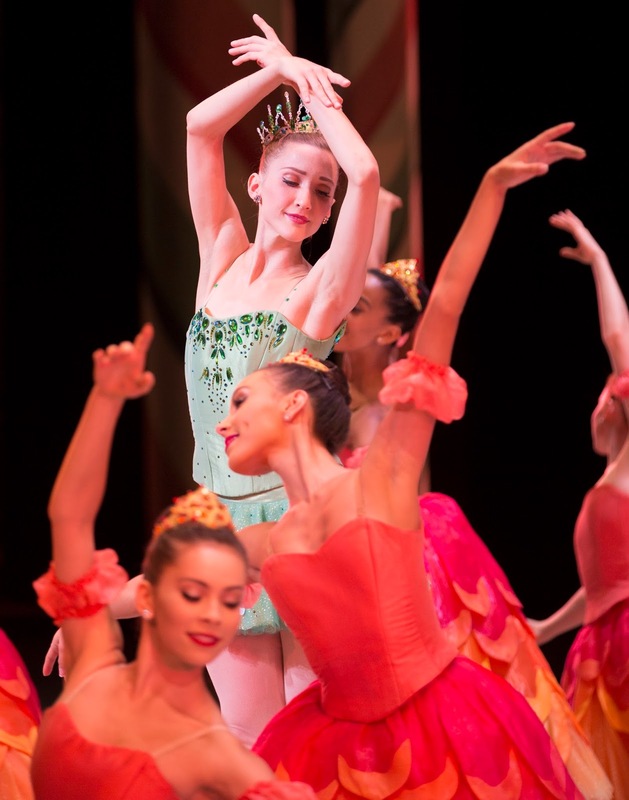 The beautiful corps de ballet member Angeli Mamon is a Dance Chance alum. 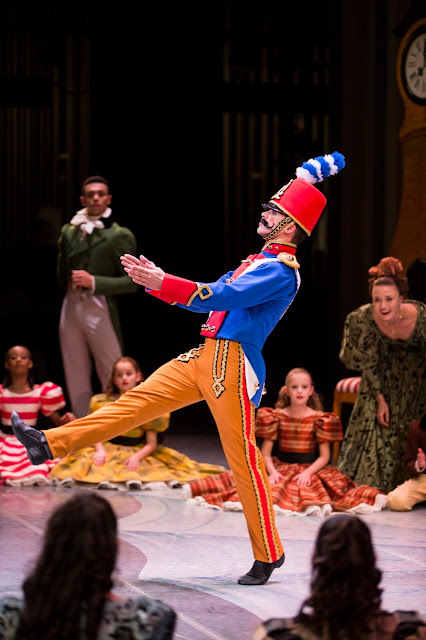 Also noteworthy for me on opening night: Price Suddarth as the Toy Soldier, Candy Cane James Moore, and the lovely Elizabeth Murphy who was born to dance the role of Dew Drop. And I can’t omit the dancing Orzas: Sarah and Seth, as the Sugar Plum Fairy and her cavalier. Sarah was promoted to principal dancer in September and I can’t think of a dancer who deserved it more. In this ballet, she gets to twinkle around waving her wand, dressed in a sparkly purple outfit. I am certain every little girl in the hall went home and dreamed she got to trade places with Sarah. In any case, when Sarah vaults backwards from the floor onto Seth’s shoulder, not once but TWICE, I held my breath. You really have to trust your partner will be there for you. Many longtime Seattleites miss Kent Stowell’s darker Nutcracker, with costumes and sets by Maurice Sendak. 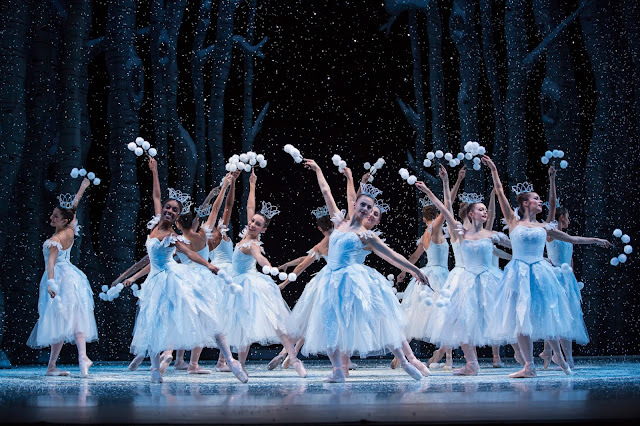 They prefer it to Balanchine’s sugar coated confection. I confess I am Switzerland when it comes to this holiday chestnut. 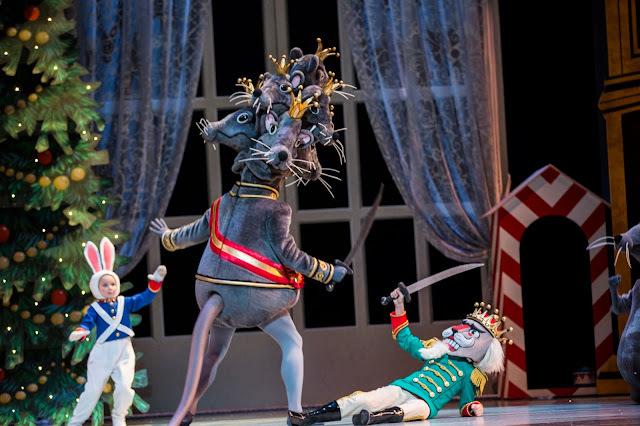 Every time I see the Nutcracker (too many to count) I’m like a little girl with my face pressed up to the plate glass window of a chocolate shop. So many tempting goodies that I don't get to eat. The lavishly trimmed tree, the rich egg nog, the happy family gatherings; they’re all part of our country’s dominant religious tradition, one that I don’t share. 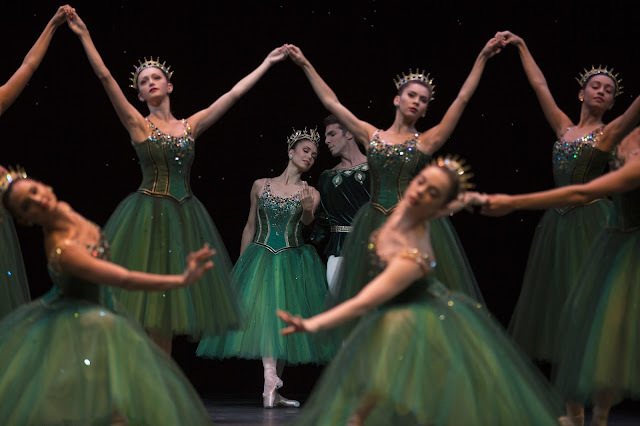 I appreciate the artistry of PNB’s dancers and its orchestra under Emil de Cou; I’m dazzled by the people who build the fantastic costumes in Larae Theige Hascall’s costume shop. Truly, those waltzing flower skirts are miraculous to behold. But when I am in the middle of all that holiday cheer, I feel like an observer from outer space, or Margaret Mead on an island in the South Seas, observing very foreign cultural customs. Ok, that's enough bah, humbug for one post. If you can, go see The Nutcracker at Pacific Northwest Ballet, or at your favorite local dance company. Take a child, watch her face light up when the snowflakes start to waltz. Try to see the magic through her eyes. If nothing else, do what I do: dream of owning your own tiara someday. I confess, I miss the boat from the Kent Stowell Nutcracker, don't you? We toss that word around so cavalierly these days that sometimes, when we encounter a real genius, the accolade doesn’t feel strong enough. Genius really is the only word that adequately describes choreographer Crystal Pite and the magical worlds she creates. Perhaps you first encountered Pite at Seattle’s On the Boards. 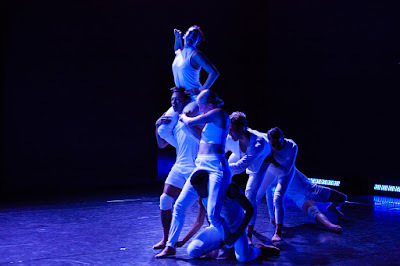 Or maybe in 2013, you saw Pacific Northwest Ballet’s presentation of her large-scale ballet ‘Emergence.’ Contemporary dance fans who thought they didn’t like ballet snapped up tickets; traditionalists were introduced to a new way of thinking about a classical art form. Then local audiences got to see ‘Betroffenheit,’ a collaboration between Pite’s dance company Kidd Pivot and Electric Company Theater. 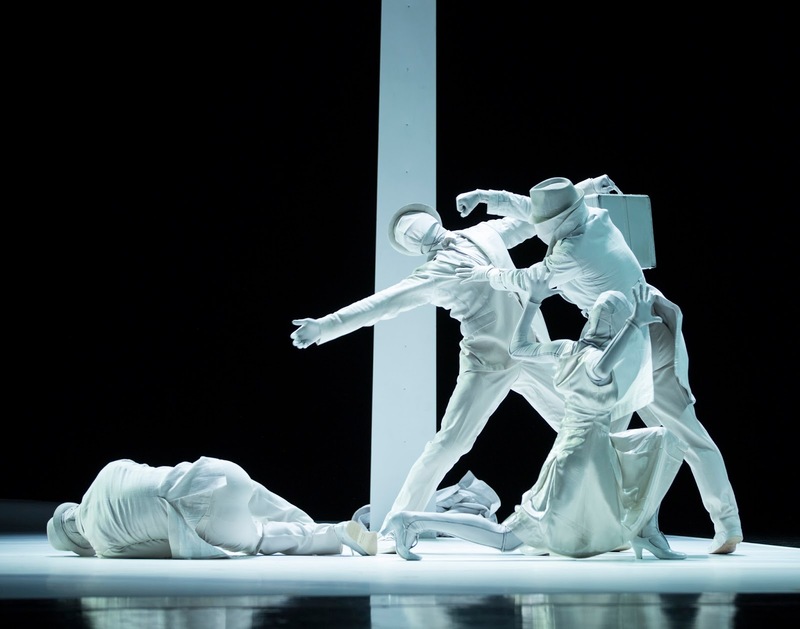 This harrowing performance about love, loss, grief, madness and redemption won Pite even more fans. If you have yet to discover Crystal Pite, get yourself tickets to one of this weekend’s performances of PNB’s latest program, ‘Her Story.’ In addition to satisfying dances by Jessica Lang and Twyla Tharp, you’ll get a chance to see the American premier of Pite’s intriguing ‘Plot Point,’ originally created in 2010 for Nederlands Dans Theater. 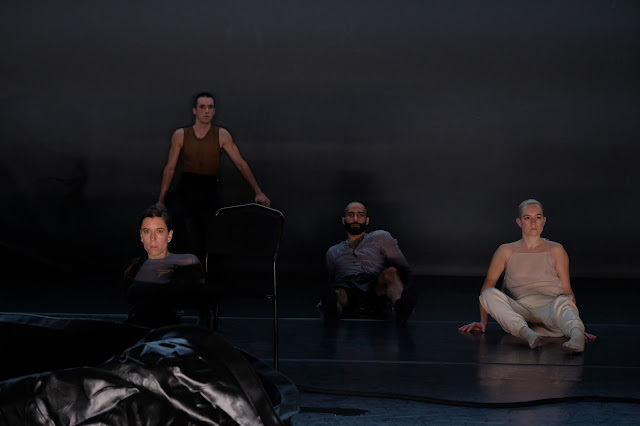 PNB Artistic Director Peter Boal says when he invited Pite back to the Seattle, she suggested revisiting this particular work, an exploration of the meaning of story. With ‘Plot Point,’ Pite creates a mysterious, almost hazy, film noir aesthetic, animated by Bernard Herrmann’s famous score for Alfred Hitchcock’s seminal 1960 horror film, ‘Psycho,’ with additional sound design from Owen Belton. Soon, we meet an amorous couple, only to discover each is married to somebody else. A jealous husband seeks revenge; a spurned wife wants to end her own life. Each of these characters is ‘mirrored’ by another faceless white doppelganger. Sometimes the replicant moves in synch with her human partner; sometimes she watches then repeats the human’s movements. When the replicant moves, she is not human but something else entirely. The replicants move across the stage with exaggerated articulation of elbows and knees, ankles and wrists, so that we see the mechanics of each footstep or turn of the head. Their fingers are splayed and stiff, like Star Wars’ C3 PO. Are they robots, like him? Do they have free will? Do these replicants actually serve to set a story in motion? 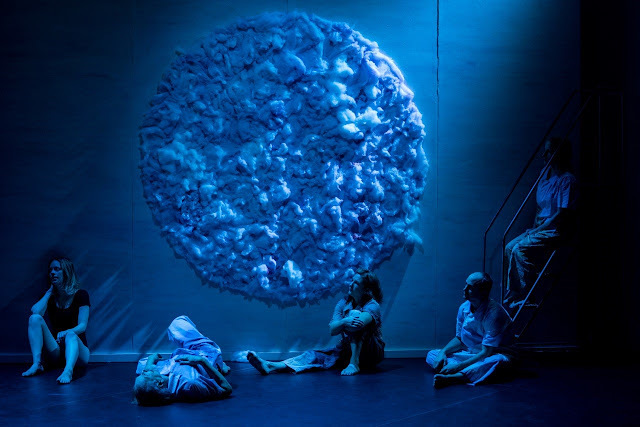 Part of ‘Plot Point’s’ genius is that--although there is no real plot, only a series of instigating actions and the ramifications of those actions--Pite has opened the curtains and ushered us into the secrets of a hidden world. It’s mysterious and fascinating, demanding and rewarding. 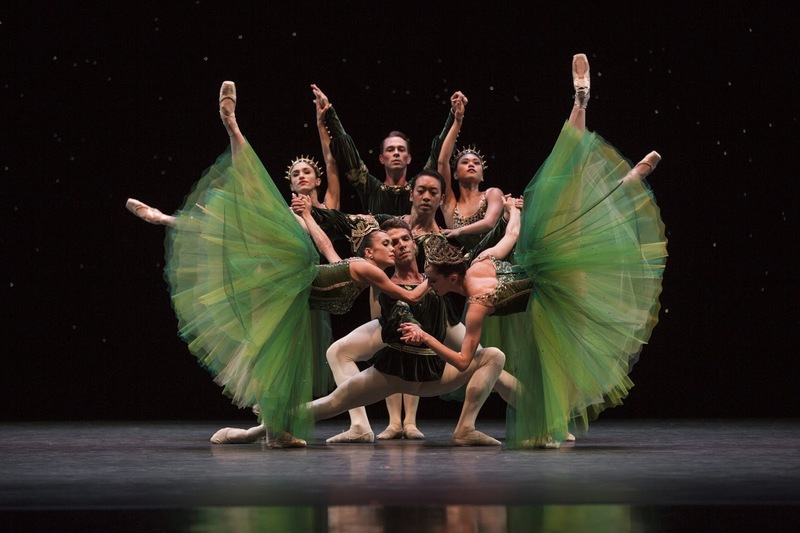 PNB’s stellar dancers rise to Pite’s choreography. In a conversation after the Saturday, November 4th matinee, principal dancer Lucien Postlewaite explained that Pite has a clear idea of how every movement should look, and where it should begin in the dancer’s body. Sometimes, he said, the movement starts with the face; other times with the pelvis, or a foot, or a shoulder. This choreography is physically challenging, but thought provoking as well. Pite never throws in a gratuitous move, everything is where it is for a reason and the entire cast embraces it fully. It seems fitting that an artist as talented as Crystal Pite would explore the mechanics of storytelling. Every work of hers that I’ve had the good luck to see has carried me on a full journey. In my mind, her greatest gift is her ability to create non-traditional narratives that fully captivate her audiences. 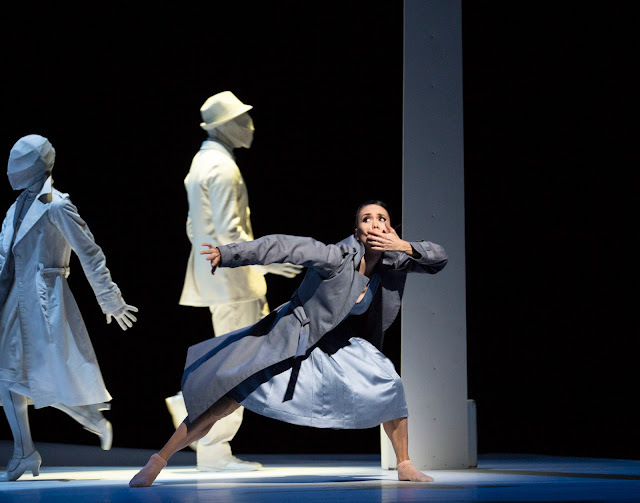 With‘Plot Point’ or ‘Emergence’ or ‘Betroffenheit,’ Pite transports me into new worlds both beautiful and strange, and always profoundly moving. I want to travel with her again, and again, and again. A well-made artwork is one of life’s great pleasures. 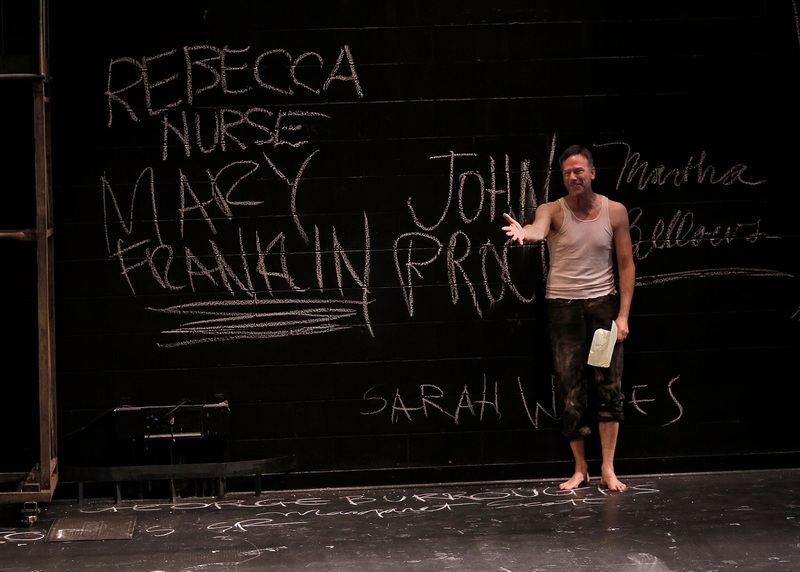 That’s exactly what Seattle’s ACT Theatre offers up with its new production of the Arthur Miller classic ‘The Crucible,’ directed by John Langs. Maybe, like me, you’ve never seen an actual live stage production of this play. And maybe, like me, you’ve been scared away from seeking one out because you had a heavy-handed high school English teacher with a ramrod stiff interpretation of Miller’s script. I advise you now to toss that baggage aside and give this play the chance it so deserves. Langs’ production is a revelation; a complex examination of mob mentality, fear of ‘the other,’ of women and sexuality, of self respect and of love. Every actor in the large cast was stellar, but at the heart of the play was a performance that is so stunning that I can’t get it out of my mind. 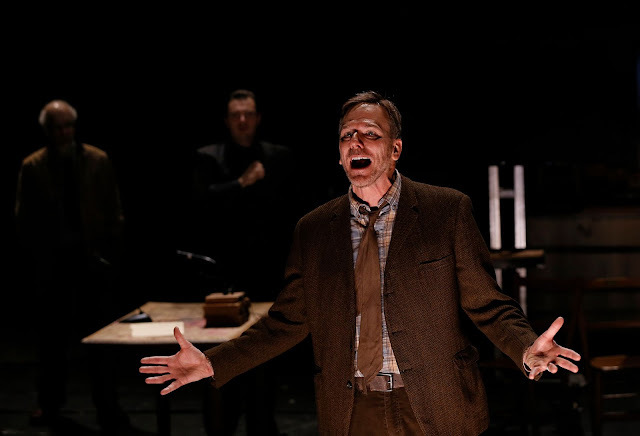 Paul Morgan Stetler came out of retirement to tackle the complex role of John Proctor, a man who commits the sin of adultery and is then forced to wrestle with the ramifications of his actions. From the first moment Stetler takes the stage until the heart wrenching final scenes, he completely inhabits the man he portrays. It’s a remarkable performance in a remarkable production, and reminded me that nobody (whether we agree with them or not) can be reduced to a one-dimensional being. Like the best artworks, ‘The Crucible’ left me shaking inside and out. Although it is almost 65 years old, this play is in no way ready for retirement. In fact, in our current political climate, it’s more relevant than ever. The first time I saw Crystal Pite’s company Kidd Pivot perform, I was sick to my stomach. I had a stomach bug but a friend insisted I go see Pite's show 'Dark Matters' at Seattle’s On the Boards. Oh my god, was I happy I went! First of all, the Kidd Pivot dancers are mesmerizing movers. Their bodies bend, twist and float in ways that seem inhuman. 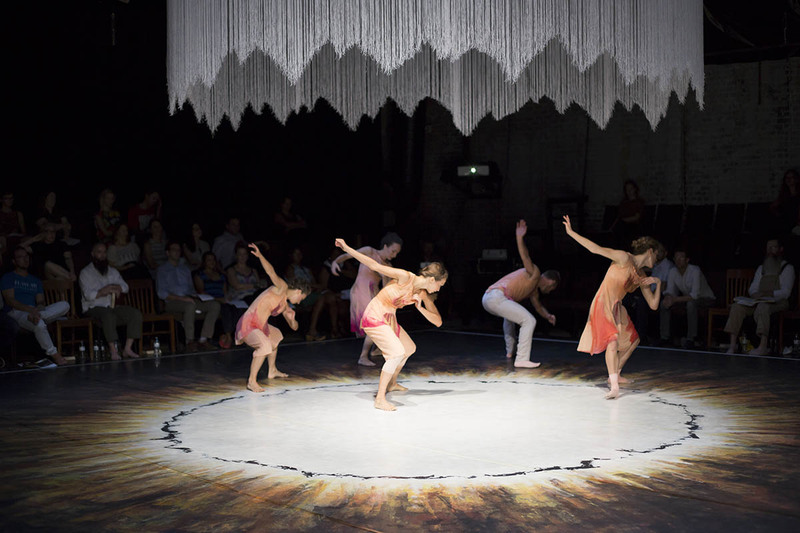 But more than phenomenal dance, “Dark Matters” is one of those rare, complete gems. Pite created a world, a dramatic arc, a narrative without an explicit plot that always moved forward. It was thrilling and is a benchmark for me when I watch other dance theater. When the show ended, I was both drained and exhilarated, and a convert to Pite-ism. I wanted more, more, more. 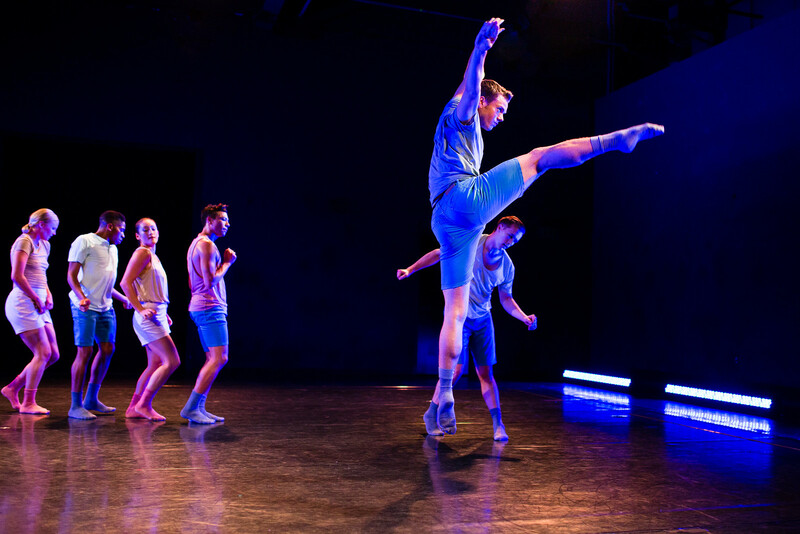 Lucky me, and lucky Seattle dancer lovers, because this fall we’ve just entered the Pite-a-Palooza of dance seasons. 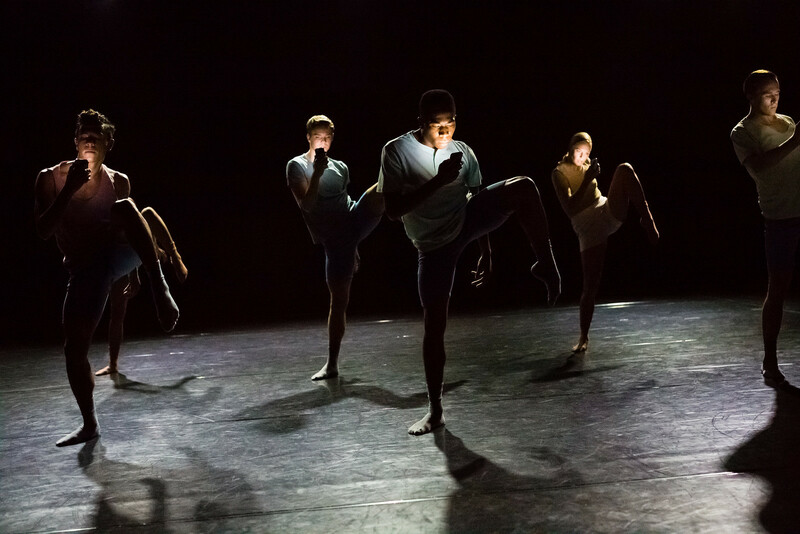 Last weekend, the University of Washington Chamber Dance Company presented a fragment from 'Dark Matters,' just to whet our appetites. Next April, Pacific Northwest Ballet brings back Pite’s incredible ballet 'Emergence,' inspired by the social world of bees, and featuring a cast of thousands. Well, dozens, but they really do fill. I’ve seen this ballet at least five or six times and I find something new with every viewing. As if that’s not enough Pite for you, On the Boards and Seattle Theatre Group will present her monumental piece, ‘Betroffenheit,’ in late March. This is a not-to-be missed performance about extreme loss, grief, madness and redemption and IT IS AMAZING. But we don’t have to wait until next Spring to enter Pite’s world. 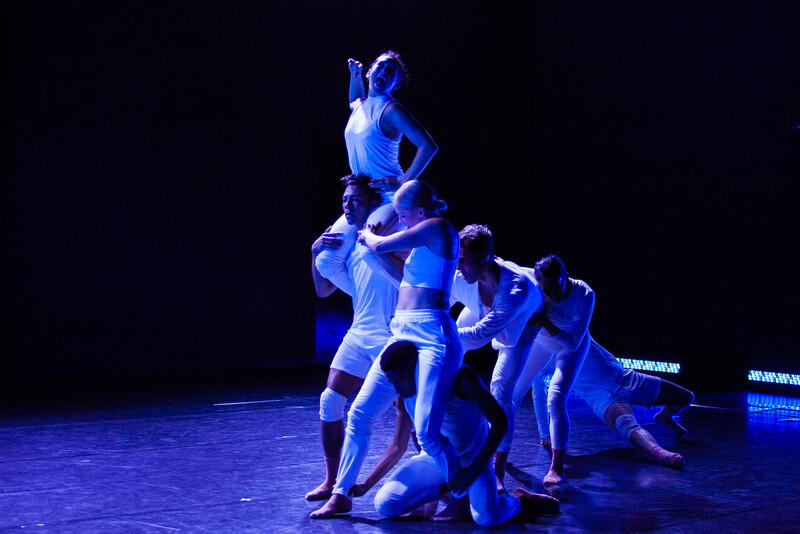 In early November, PNB presents the American premiere of 'Plot Point,' a work Pite created for Nederlands Dans Theatre in 2010. 'Plot Point' was inspired by Alfred Hitchcock’s classic film ‘Psycho,’ and is set to the 1960 score by Bernard Herrmann, with additional music by Owen Belton. 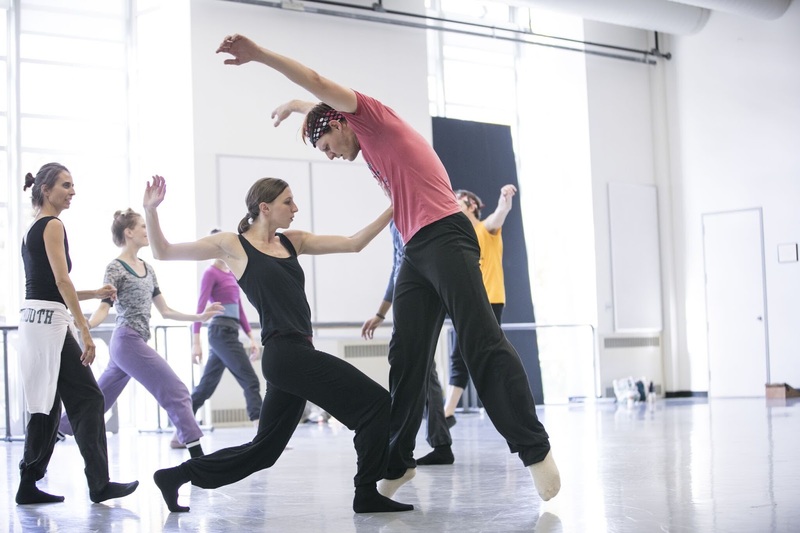 I recently had the opportunity to watch Crystal Pite work with her PNB cast in the studio. Although she’s now a mother in her 40’s, Pite is still as nimble as dancers half her age, watching a video of the original production then demonstrating the movements with unflagging energy. She’s not only teaching this ballet; she’s tweaking and refining her choreography, making changes to both fit the PNB dancers and her own new perspectives on an older work. 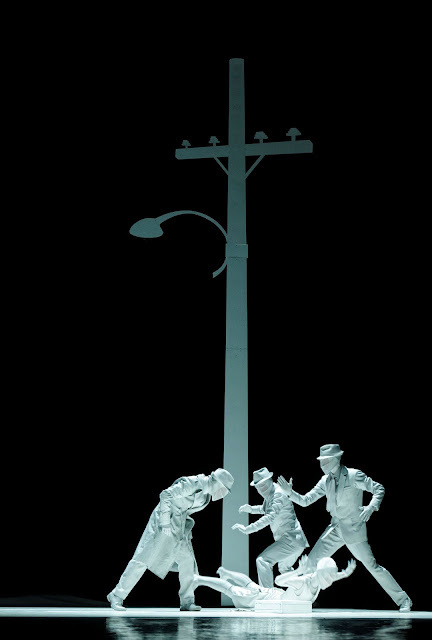 The dance promises to be as eerie and potentially violent as the Hitchcock on which it was based. It’s fascinating to watch traditionally trained ballet dancers approach Pite's most non-traditional movement vocabulary. Where most ballet choreographers ask for long extensions of legs and feet, arms and hands, creating beautiful lines, Pite looks for angles and bending torsos, swooping limbs and lots of theatricality. A tight clump of dancers slinks across the stage, bearing a cake for a waiting woman, wide rictus grins on their faces. Another woman moves away from the group, shoulder slumped, almost trudging, carrying some type of burden. 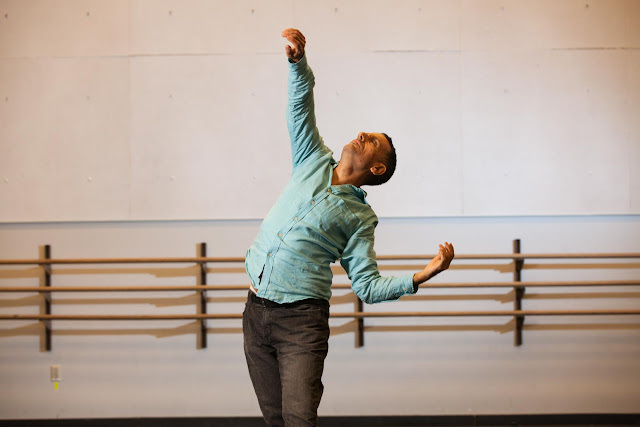 NDT production of "Plot Point"
After two hours of demanding rehearsal, PNB Principal Lucien Postlewaite was beaming. He says Pite has asked him and his fellow dancers to transcend their training, and it was clear he loved the challenge. 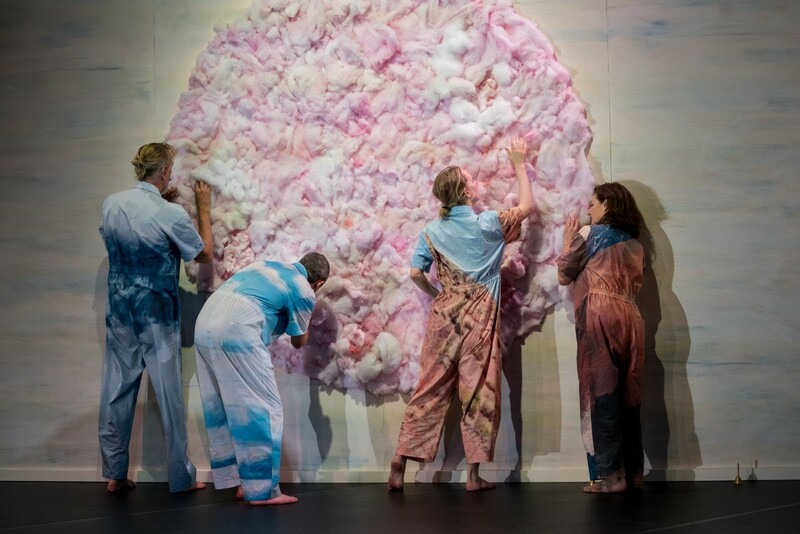 Judging by the rehearsal, and these photos from Nederland Dans Theatre, 'Plot Point' is sure to bring PNB audiences something altogether new. The American premiere of Crystal Pite’s ‘Plot Point’ is part of PNB’s ‘Her Story’ program, opening at McCaw Hall on Friday, November 3rd. It shares the bill with Twyla Tharp’s ‘Afternoon Ball,’ created for PNB in 2008, and Jessica Lang’s evocation of painter Georgia O’Keefe, ‘Her Door to the Sky.’ If you come to the Saturday, November 4th matinee, I'll be moderating the post-show talk with PNB's Peter Boal and selected dancers. It should be a blast!